While growing up, I was fascinated by Urdu stories set in Al-Andalus and the the Moorish Spain. Many, in fact, focused on the last decades of Muslim Granada - a ready-made nostalgic premise. For those familiar with Urdu literature, a number of these historical fictions were written by Naseem Hijazi (his Shaheen, about the fall of Granada, was also made into a television series in the 80s). While his portrayal of characters was often in stark black & white, he was nevertheless quite successful in creating an interest in that part of Muslim history, at least for me. I had a chance to visit Alhambra (Granada) and Cordoba in 2004 and it was a fantastic experience. The Arab quarter of Granada still resembles a medieval town - narrow, winding streets, and houses with square courtyards in the back. What further helps in preserving an old look is the fact that streets often too narrow to allow any cars in there (picture on the right. All three Granada pictures were taken during the 2004 trip). “Blood and Faith” is a splendid work of synthesis. The story begins with the 10-year war — a crusade — to conquer the Moorish Kingdom of Granada. The Christian victory in 1492 signaled the beginning of the long ethnic cleansing of Holy Spain. Spanish Jews were the first victims; they were quickly forced into exile. The other ethnic and religious minority in the Iberian peninsula, the Muslim Moors, posed a more complex problem. The slow breakdown of this living-­together (convivencia) began with the conquest of Granada. 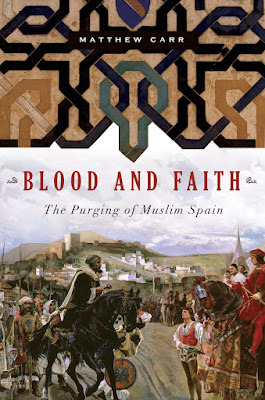 In 1492, the Muslim Granadinos were unwillingly incorporated into Christian Spain, but this brought nothing but trouble. Most fought an unremitting rear-guard action in defense of their culture, Islamic faith and social institutions, resisting a forced conversion to Christianity by any possible means. They posed a real danger to Christian Spain. Granada’s long coastline offered an open frontier to the Ottoman Turks, Spain’s mortal enemies. In 1568, after repeated small revolts, a civil war of unceasing savagery erupted. It was bloodily suppressed by 1571, and thereafter there was no going back on either side. As many as 80,000 Muslims — men, women and children — were deported deep into the Christian heartland. Yet this provided no solution. Some contemporary writers had contrasted the “peaceable” Moors of Aragon and Castile with the “savage” Moors of Granada, but this distinction soon became irrelevant. All Muslims, peaceable or savage, were increasingly regarded by their Christian neighbors as malign and dangerous. Over the next four decades, Spanish officials planned the purgation of the Muslim threat. Every remote possibility was canvassed — drowning, castration, exposure on the icy shores of Newfoundland. As time passed, the government’s resolution hardened: it was no longer a matter of if but of when and how. Finally, from 1609 to 1614, an estimated 300,000 Muslims were marched to the coasts and put on ships for North Africa. In his epilogue, “A Warning From History?,” Carr’s message is stark. The current language of outrage in Europe — indulging prophecies of imminent demographic doom brought on by fertile Muslims — is heading toward the idea of an “agreeable holocaust,” which is what a 17th-century Dominican friar called Spain’s final solution to its insoluble problem. We should know better. Absolutely. This is an excellent suggestion!